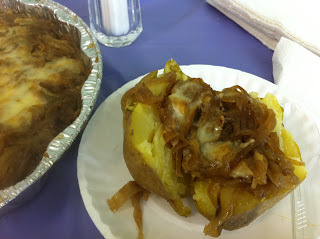 In honor of Library Week, my library celebrated with baked potatoes. Because nothing says Library like potatoes. Management provided the baked potatoes and supervisors provided the toppings. "Adventurous staff" could also supply toppers. How could I resist such a challenge? This recipe is an adaptation of the caramelized onions from a previous post about onion soup. But without the soup. Here, the onions are served two different ways, first as a potato topper. This second option is my take on one of the many appys served at a family wedding a few months ago. I was so bowled over by the bowl of dip that I marched over to the caterer and raved about how delicious the onions were and asked what cheeses he used. He was nice enough to let me know that just mozzarella cheese graced his dip. This month's Kosher Connection challenge is to prepare "the best thing I ever ate." Sounds way easy, no? But think about it. How many times have you eaten something so delicious that you practically had to hold yourself back to keep from licking off the plate? I bet it's more than just a couple. Same for me. Except I didn't hold back. Luckily I was home and the kids weren't watching. So I made a list of all the every dish that really blew me away. Then narrowed the lot down to those I liked as a kid, as a young adult, and finally as an alte cockeh mature individual. 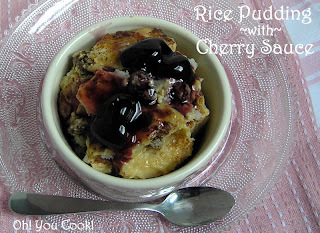 From this now very short list, rice pudding with cherry sauce was far and away the winner. Oh, yum! As a kid, my family used to occasionally eat at the local Jewish dairy restaurant. You can read more about the rice pudding of my youth along with a recipe clone here. This version today is a slight adaptation of the one in my cookbook. Takes a little longer, but just as yummy.